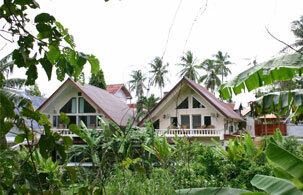 Phuket Country Houses has affordable luxury property available for short or long term rent. The property is located next to a jungle in Chalong, ideal for tourists or residents who want to live in peace but be close to the island's popular attractions. This villa is located in a quiet, green area of Chalong, in the southeast corner of the island; it's a 45 minute ride from the airport and only 25 minutes from Patong. The beautiful, unspoiled Nai Harn Beach is only a 15 minute ride away, and Central Festival, with its western supermarket, 6-screen cinema and mixture of western and local shops, only 12 minutes. Other attractions such as elephant rides, waterfalls, the aquarium, zoo, gibbon sanctuary and historic Phuket Town are between 10 and 40 minutes away. The most impressive temple in Phuket, Wat Chalong, is just 2 Km along the road. As the property is as close to nature as possible, there is varied wildlife visible at various times during the year. Cacouls, Chinese Pond Herons, Drongos and other birds are regular visitors, whilst fireflies are a common sight during the evenings. Bananas grow by a stream right beside the property. The entire three bedroom property is a non-smoking zone. Two second floor bedrooms each have a private balcony, whilst the ground floor bedroom, complete with en-suite bathroom, has a small private patio. Bedroom 1: Queen-size bed, en-suite shower room, private patio, jungle view. Bedroom 3: King-size or twin beds, dedicated shower room, private balcony with jungle/hill views. All bedrooms feature both air-con and ceiling fans, TV with DVD player, hairdryer, reading lamps and bookcase with a wide selection of English language books. The mattresses are pocketed springs, and there is a variety of pillow thicknesses. Tea and coffee making facilities are available in the breakfast room. The villa also boasts a fully air-con 7 seat cinema room with reclining chairs, 8 foot screen and 5 channel surround sound system. Movies or TV shows can be viewed and there's a library of 5000 DVD's and 3,400 CD's to choose from. Unlimited free Wi-Fi is available throughout the property. There's an extending dining table in the breakfast room which can seat up to 10 people. From here guests can reach the garden via French doors. The breakfast bar has a toaster, small oven, microwave, 2 DeLonghi espresso machines (one for regular, one for decaffeinated beans), kettle, fridge and sink unit. Guests can help themselves to a Super Continental breakfast from the fridge, so breakfast can be enjoyed at the guests' chosen time. Breakfast includes cold meats, cheeses, croissants, bread, butter, tropical and European jams, honey, marmalade, muesli, cereals, milk, fruit and fruit juice, plus a selection of teas and fresh coffee. All 3 shower rooms have acrylic enclosures, hot water rain-showers, hand showers and non slip shower mats, flushing toilets with bidet hoses, hand basins with hot and cold water, towel rails, fans, and extractor fans. Bathmats, bath towels, hand towels and flannels, liquid hand soap, body shampoo and hair shampoo are also provided. 1 shower room is ensuite with bedroom 1, whilst the remaining 2 are located on the ground floor and are allocated to bedrooms 2 and 3. Rooms are available to rent at 1,500 Thai Baht per room (max 2 guests per room) per night including breakfast. For bookings of 3 or more nights the price includes free arrival and departure airport transfers.